In an increasingly globalized world, many people are confronted with different cultures. A great many of us have been foreigners or will be foreigners in our lifetimes. Few experiences are as exciting and as terrifying as meeting people who are different from us. Many of us have preconceived notions about other people. These preconceived notions give us a sense of control in an unfamiliar environment. Despite this many foreigners feel like outsiders. But does one really have to be a foreigner to be an outsider? Or are we all outsiders in some way in our daily lives? 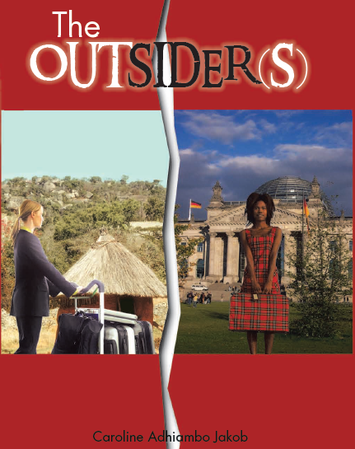 The Outsider(s) is a satirical novel about differences, career, family, poverty, naivety, destructive politics and human dysfunction. It tells the story of four women who on the surface are very different. Irmtraut Eickelschaft plays in the upper league of nightmare bosses. In the ‘Shark Kingdom’ where she is a citizen, staying one step ahead has as literal a meaning as it gets. When her fierce rival Nadia speaks during a tense meeting with Chinese investors in what sounds like perfect Chinese, she realizes that she has to act. That act pushes her from her life in her native Germany and lands her in Africa, a place she has so far only seen on TV. And not necessarily in good light. Philister Taa, barely surviving on Nairobi streets sets out for ‘Majuu’, a place where according to her ‘knowledgeable’ friend Tamaa Matano is the gateway to riches and success. What follows is a story about Kenya and Germany. Two countries that have only one thing in common; their differences.